This classic trench style knife features an 8" blade constructed from stainless steel accented with intricate circular cut outs. 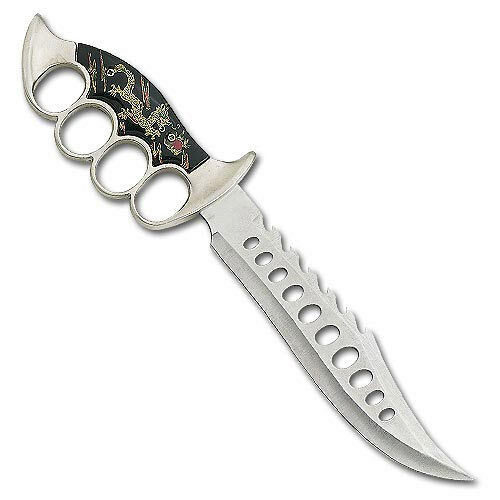 The black lacquer handle is adorned with colorful dueling dragons surrounded by the steel finger guards. Includes top quality sheath. 13 1/2" ov. Me and my buds just love these blades ....we spare with them and they can take a beating. We taken out the plastic inlay and replaced them with hard wood and varnished them 10 times...whooo good balance and very sturdy. Nice knife, a little light weight, but was sharp. Good knife for display or collection. Do not think it would hold up well in heavy use. A true showpiece,beautiful and glimmering,is a great description of this knife. Just right for a mancave. Little tasks not involving true pressure on the blade would be something this knife could be used for.For 10 dollars, a sure winner. Jerry Hines AKA THE KNIFE MAN. it looks exactly as pictured. feels like in your hand. sheath is better then most other knives at 3 times the price. I just got this sword and the crafting is beautiful. I was very pleased when I got this weapon. The blade is sturdy but might need some sharpening. The sheath and the brass knuckles were in good condition and very nice.